A small property claim can be handled quickly and efficiently at an inside claims desk; however larger and more complicated losses require the personal touch of an outside claims representative. There is more at stake for everyone, and insurance companies invest in rigorous training to make certain that their field adjusters have the knowledge they need. But that’s not all it takes… a job as an outside claims adjuster allows a degree of freedom, but it also takes insurance knowledge, organization, dedication, and the ability to juggle multiple tasks at once. The following are some mobile office tips that help get the job done. A fact, not a “tip.” However, the mobile office is ground zero. In some cases, insurance companies foot the bill for an actual mobile office, complete with a company logo and all the equipment an adjuster needs to get the job done properly. Most often, an adjuster’s mobile office is a company or personal car. If they traveled a long distance, a mobile claim office could be a hotel room. A field adjuster will log a lot of miles in their “mobile office,” so they should make certain to equip it properly for the task. Fortunately, modern technology makes it easier than ever to access the mobile equipment to get the job done right. No one expects an adjuster to know every word of every HO form, business owner, or commercial property package policy. However, a basic knowledge of policies is still a necessary skill when an adjuster is out on their own. Adjusters should have access to all of the relevant forms and a working knowledge of how to analyze coverage issues. A field adjuster’s job is 24/7. So are their family and personal life. When business and personal lives overlap, conflicts can obviously arise. An adjuster can help avoid missing an important claim appointment or family event by organizing everything within the same calendar and setting appointments accordingly. 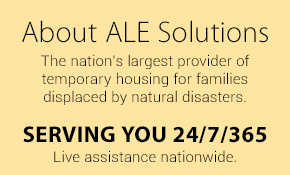 Contact ALE Solutions for more information on how property adjusters investigate claims in the field. And, check out part 2 of this series! Manage policyholder housing from any device with the MyALE Claims Management portal. An interesting idea, to say the least, to have a mobile office; I like it! The overall theme I got from your article was to stay organized. Sometimes I think this handy tip goes overlooked, not just in this field, but all; it really is so important.